We offer a fully inclusive service to ensure your company documents are correctly legalised for use in Thailand. Simply send your documents to us and we will complete the entire process from start to finish. We can arrange for the solicitor certification, add the apostille certificate and then attest the documents at the Thai Embassy in London. UK companies conducting business in Thailand may be asked for certain documents to be legalised. Simply let us know which documents these are and we will offer the best solution to get this completed. Our inclusive service takes care of solicitor certification, the UK apostille and the embassy attestation. Your documents will be legalised for Thailand so you can get on with business. We make every effort to process orders as fast as possible and most orders are completed in just 7 to 8 working days. Print a copy of the order form if you would prefer not to order online or want to pay by cheque, postal order or bank transfer. Visit our online ordering pages to select your legalisation service and pay online securely. 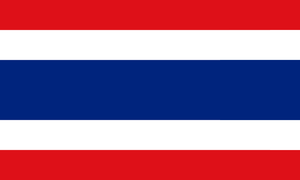 How do we attest business documents for Thailand? We make sure your document is preapred correctly and is suitable for submission to the embassy. If your document needs to be certified by a solicitor we take care of it. The apostille certificate is then added to the document and embossed. We submit the documents to the embassy for stamping to complete the attestation. Call Us. Email. Chat Online. Excellent Customer Service. All inclusive service with apostille and embassy. Most orders completed in around 6-8 working days. We can certify your documents to save you time. We can deliver your documents anywhere in the world. Some documents can be emailed to us. Simply print the PDF order form and post to us. Click Buy Now buttons and pay online. Then post your document to us. During normal office hours you can call us, chat online or send us an email. We are happy to discuss your requirements and offer the best advice on how to proceed. What Does Thai Attestation Look Like? The attestation issued to a document varies from embassy to embassy. 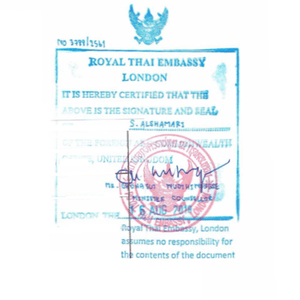 The Thai Embassy in London only accepts documents that have the UK apostille certificate attached. Using a professional embassy attestation service ensures documents are correctly legalised. Our service includes document checks, solicitor certification when required, the UK apostille and the embassy stamps. Let us handle your important documents for you. If you have personal documents that need attesting do not hesitate to contact us. We can legalise degree certificates, other qualifications, birth certificates and many other UK documents.